Another bobsluckycat post presented by Mellow's Log Cabin! In early 1956, this album was released by Deutsche Grammophon Gesellschaft to many European countries. These was no comparable American album from Coral, released in the USA. 1956 was the year that many styles and small record labels converged with the big national labels fueled by payola to the d.j. 's and the distributors and some really good music coming out that was different and that was aimed squarely at the core audience which was the 12 to 22 years old demographic or so. The Supreme Court of the USA struck down "separate but equal" in 1954, segregation was rampant in the land. The record business was in the forefront of change. Small independent labels had sprung up since World War II with fresh new ideas and artists and were taking a greater market share almost daily. New recording equipment, i.e. Hi-Fidelity recording and magnetic tape came into wide use as well. King Records had Blue and Red labels on their records for one thing. Blue was "race", Red was everything else, but mostly country music. King switched to an all blue label in 1954, and dropped most country recording artists as their contracts ended by the mid-50's. King also released a wide range of music on its subsidiaries Federal and DeLuxe. King then concentrated on Blues, R&B, and Jazz aimed at the target audience and Blacks as well. Not wanting to look like the parents record label, RCA Victor had in house start-ups Groove, "X" and Vik for a while. Decca did as well with Coral and Brunswick to some degree, and on and on. Nobody in early 1956 really knew what Rock-n-Roll was for sure and they still don't, in my opinion. A lot of the music heard on this LP just went away or to adult middle of the road venues. Elvis had hit big as did many others by this time and everybody was just scrambling to make a dollar. Enjoy this LP for the time capsule it is. 01 - Steve Lawrence: A popular "Pop" music singer who starred as the featured male singer on the "Tonight Show" for four years along with future wife Eddy Gorme. Lawrence covered this R&B hit by Big Joe Turner on Coral 61563 in late 1955 with no success. 02 - Alan Freed was a very influential D.J. first in Cleveland and then at WNEW in New York City. He put this record out in 1956 on Coral 61660 with no chart action. 03 - Lawrence Welk & His Orch featuring Buddy Merrill, his band member on lead guitar and country style vocals usually, attempted Rockabilly on Coral 61649 in 1956 without any success. I have no idea why. 04 - Georgie Auld & His Orch. covered "Plantation Boogie" on Coral 61381, recorded April 04, 1955. 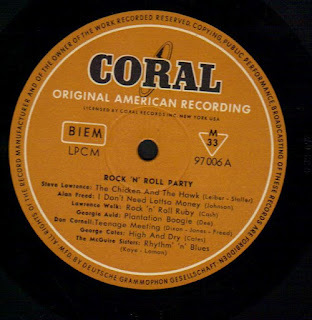 Lenny Dee had the hit on Decca in January 1955 and it was also covered by Red Foley with a Country vocal, also on Decca, the main label of which Coral was a subsidiary. 05 - Don Cornell, a "Pop" music singer out of the big Band Era with Sammy Kaye's Orch, had several pop hits through the 50's by himself and also with Johnny Desmond, And Don Cherry as the "3D's" on Coral. This song from early 1956, Coral 61584 failed to chart. 06 - George Cates, born in 1911, was the musical director of Coral Records for a number of years and was closely associated with "movie" music. This unknown cut has to be from from some jazzy album, but I have no information otherwise. 07 - The McGuire Sisters, three sisters from Ohio signed with Coral in 1954 and were extremely popular and had a long string of hits and hit cover versions from then through 1961. This song, from early 1955 failed to chart, however. 08 - Freddie Mitchell was an R&B, Jazz piano man who cut this song on Brunwick 84023 in 1953 for that label which was the "race label" at the time for Decca. 09 - The Goofers were a "white" cover act on Coral who covered a lot of Black artists between 1954 and 1956 and sold a lot of records to a still very much segregated audience. 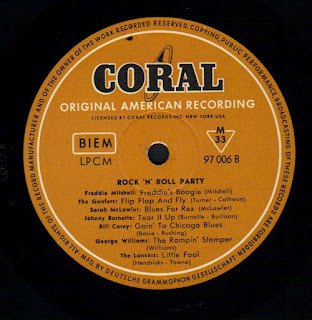 This was one such record from 1955, Coral 61383. They borrowed heavily from the Bill Haley & The Comets sound, thanks to producer Paul Cohen. This sold a lot of records and got tons of air-play on radio stations where Big Joe Turner had no chance of being heard over the air. 10 - Sarah McLawler was a hammond organ player much in the style of Bill Doggett, her R&B and Jazz infused sides were released,on King Records, Brunswick and finally on Vee-Jay between 1952 and 1956. This cut was released on Brunwick in 1953. 11 - The Johnny Burnette Trio consisting of Johnny Burnette, Dorsey Burnette, and Paul Burlison were discovered while appearing as contestants on the Ted Mack Hour TV show (much like today's "American Idol" show) and signed to a contract by Coral Records. They were from Memphis, Tennessee, but not from the "Sun" stable. They had some moderate hits through 1959, when the brothers split and started separate singing careers in California to great success. This song, Coral 61651 is from early 1956. 12 - Bill Carey had several releases on Coral in the Mid-50's all in an R&B vein and maybe he was a singer with Count Basie's Band or Johnny Otis's Band, given the vibes on this recording. I have no other information. His style is somewhat in the Joe Williams vein. 13 - George Williams & His Orch. recorded this big band R&B instrumental "The Rompin' Stomper" in 1953 and it was released as Coral 61121. It was a popular theme song for many D.J.'s. 14 - The Lancers formerly on Trend Records where they had a 1953 hit entitled "Oh, Sweet Mama Tree-Top Tall", signed with Coral records in 1954 and like the Goofers had "white" covers of Black R&B artists between 1954 and 1956. This song, Coral 61616 charted in 1956 briefly. Research and notes by bobsluckycat. Thanks for your comment, Mellow. A link would be greatly appreciated. Best wishes. Hi Mellow, my first comment seems to have caused some confusion. You left a comment on my blog and I just wanted to thank you for saying that you would put a link to Catch That Train here on Mellow's Log Cabin. Thanks again. This is a great post. I haven't listened to the music yet, but the historical aspect of it makes it most interesting. Could you PLEASE repost the link? It's dead and I GOTTA hear that Lawrence Welk version! Bill Carey (aka Bill Snary) was my uncle. He didn't sing with Count Basie or Johnny Otis to my knowledge, but he was on radio and TV in Chicago quite a lot in the 1950s and then moved on to the west coast, where he sang in clubs and did some acting (small role in "Born Losers," the original Billy Jack film). He once told me he tried to emulate Billy Eckstine. His single "Heavenly Lover" (Coral 61429) made Alan Freed's top 25 in July 1956. Thanks for posting this. I didn't have a copy of this song. Outstanding Coral Rock'n'Roll Party. I loved these details. Well my best friend is turning 24 soon and I want to throw a wine tasting themed bash for her at some local event venues Chicago. But I need some nice ideas for the decorations. Could you help regarding it?